When you are designing a new home you must meet insulation regulations and U-values but, if you are able to build to a higher standard, you will improve the running costs of your home. 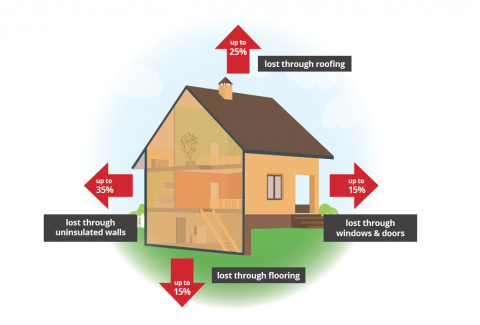 Once you have identified the key areas of heat loss, there are many products available for both new and old properties to improve heat loss. A wide range of airtightness products are available which prevent air leakage. Designing these into your build will greatly reduce heat loss at main leakage points in your house, which include joints, gaps and cracks in the construction, cracks around door and window openings and gaps where services enter the building, such as downlights in loft areas and pipes in external walls. Where pipes and cables penetrate the property these can be sealed with pipe grommets to ensure air tightness. Special tapes are available to seal around windows. As well as purchasing the best insulation for your property, it is just as important to make sure it is installed correctly to make sure it is as effective as it can be. For example, if you lay storage boards over insulation in your loft, it will become compressed and won't trap heat as well. Ensure you do have adequate insulation in your loft. Check current regulations for new builds to ensure yours is up to scratch. You should also check that it hasn't been compressed by storage. Consider insulating your loft hatch as well as your loft. A compression seal or foam strip around the perimeter of your loft hatch will stop draughts and if you want to insulate your loft hatch yourself, glue a plastic bag to the top of the hatch and fill it with insulating wool. You can also save yourself some time and effort by buying a ready-made insulated hatch. A considerable amount of heat can be lost through a chimney. Chimney balloons stop warm air going up your chimney, draughts coming back down and will even stop dust, debris, rain and birds coming down the chimney and into your room. Draught-proofing your doors and windows is one of the cheapest ways to prevent heat loss. Remember that you can lose heat through letterboxes and keyholes but brushes, flaps and metal discs can be bought to cover these. Gaps and skirting boards can be filled with flexible fillers to insulate them. You need to use a flexible product as skirtings and floorboards expand and contract as they heat and cool. As well as making your home airtight you should also ensure that there is adequate ventilation. In new homes it is quite common to install a heat recovery or mechanical ventilation system. In older homes you will probably find that there is enough natural ventilation but ventilation systems can be installed as a retrofit. If you need more technical advice and information, talk to one of our expert staff members in store or call us on 023 8038 5385.